Lines 1 and 2 have affinity of quality of line, because they're both nearly straight. Lines 1 and 4 have contrast, because one is straight and the other curved. Certain adjectives and emotional moods often are associated with quality of line. Most of the other basic visual components don't have preexisting emotional characteristics associated with them, but straight and curved lines often do. Generally speaking, a straight line is associated with these characteristics: direct, aggressive, bland, honest, industrial, ordered, strong, unnatural, adult, and rigid. A curved line often is associated with these characteristics: indirect, passive, pertaining to nature, childlike, romantic, soft, organic, safe, and flexible. These characteristics can create predictable stereotypes and are only a general guide. Your own feelings about straight and curved lines will affect how you use them. Chapter 9 explains how any descriptive characteristic can be assigned to any basic visual component. These pictures illustrate contrast or affinity of quality of line within the shot. The contrast of straight and curved lines increases the overall visual intensity. The affinity of the straight lines keeps the visual intensity low. This pair of shots illustrates affinity of line quality. All the lines in both shots are straight. There are many other ways to apply the Principle of Contrast & Affinity to line including thick and thin, continuous and broken, long and short, and in-focus and out-of-focus lines. These are important considerations in a drawing class, but it becomes difficult for an audience to notice these aspects of line during a story filled with moving images and sound. It is also difficult for a filmmaker to control them. Occasionally these secondary aspects of line become visually important in film and video, but usually they have little effect on contrast and affinity. Orientation, direction, and quality are visual aspects of line that are immediately useful to the picture maker, because they are quickly recognizable by an audience. 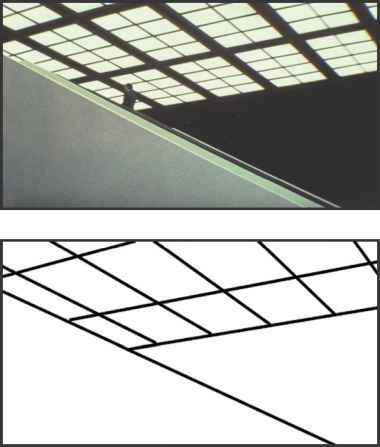 Just as there are basic types of spaces and lines, there are basic shapes. The basic shapes are the circle, square, and equilateral triangle. Shapes exist in a visual space that can be flat or deep. Therefore, shapes can be classified as two-dimensional (flat space) or three-dimensional (deep space). The circle, square, and triangle are two-dimensional. The sphere, cube, and three-sided pyramid are three-dimensional. 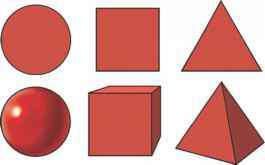 A shape can be classified as basic only if its unseen sides can be predicted correctly by examining the visible sides. A three-sided pyramid reveals all the information needed about the shape of its hidden sides. The cube does the same, and of course a sphere's shape remains identical no matter how it's turned. 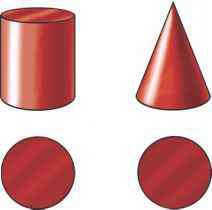 Many other shapes including the cylinder and cone often are incorrectly classified as basic shapes. When viewed from below, the cylinder and cone appear identical and give no clue that one is pointed. This disqualifies them as basic shapes, because they hide their true shape identities. Another reason why many shapes aren't classified as basic is because it makes shape recognition too complicated. Basic shape differences must be easy to see. 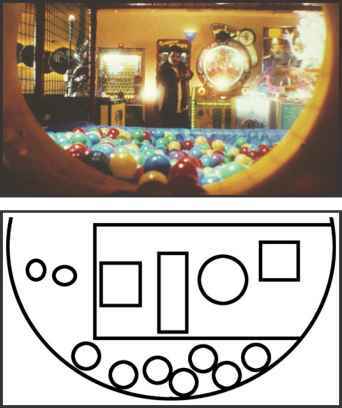 Visually speaking, it's too difficult to notice small differences in the shapes of objects. An audience can't easily see the shape difference between a three-sided pyramid and a four-sided pyramid, for example. The circle, square, and triangle are visually different, useful, and within the perceptual reach of an audience. Simplification makes structuring the complex visual component of shape possible. The real world is filled with millions of objects, and each one seems to have its own unique shape. 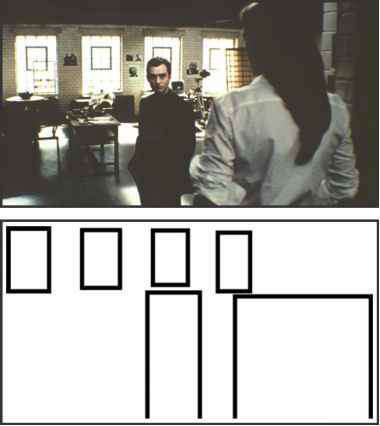 The basic shape of any object can be revealed by reducing it to a silhouette. Any object, no matter how apparently unique, can be categorized into one of the three basic shapes. Here are the basic silhouettes of three cars. The first car is based on a circle. The circle is the most benign of the basic shapes. It doesn't have an up or down or any sides. A circle has no direction or intrinsic visual dynamic. Most people describe cars with a circular shape as friendly or cute. This middle vehicle is obviously based on a square shape. It is less friendly than the circular car, but it seems to possess a visual stability and solidity that the circular car lacks. The fastest of the three cars has the shape of a triangle. It may be a high performance racecar, but its basic shape is a triangle. The triangle is the most dynamic of the three basic shapes, because it's the only shape that contains at least one diagonal line. A triangle is an arrow. It points in a particular direction, which is something the square and circle can't do. Every object has a basic shape that can be discovered by reducing the object to its silhouette. 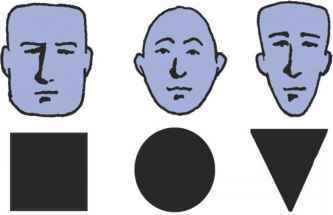 Faces can be categorized as basic shapes. 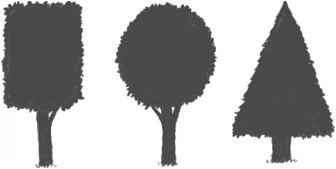 Trees come in three basic shapes, too. Furniture and everything else can be classified into one of three basic shapes that can easily be seen by looking at the object's silhouette. Light patterns and shadows can also produce circles, squares, and triangles. The same emotional characteristics associated with curved and straight lines can be linked to round, square, and triangular shapes. Rounded shapes often are described as indirect, passive, romantic, pertaining to nature, soft, organic, childlike, safe, and flexible. Square shapes are direct, industrial, ordered, linear, unnatural, adult, and rigid. Because of their diagonal lines, triangles often are described as bold, aggressive, dynamic, angry, menacing, scary, chaotic, disorienting, and unorganized. Remember, these emotional associations are not rules and can lead to stereotypes. Chapter 9 will explain how almost any emotional characteristic can be attached to any line or shape. Among the two-dimensional shapes, the circle and triangle have maximum contrast. Using three-dimensional shapes, the sphere and the three-sided pyramid have maximum contrast. If the two- and three-dimensional shapes are grouped together, maximum contrast is best created by the sphere and the triangle or the circle and the three-sided pyramid. These two combinations create contrast in the basic shape, as well as in their two- or three-dimensional properties. Here's an example of contrast of shape within the shot. The triangles contrast with the squares. This picture illustrates affinity of shape within the shot. All the basic shapes in the shot are squares. Contrast and affinity of shape can also occur from shot to shot or from sequence to sequence.